This recipe can easily be cut in half if fewer servings are needed. 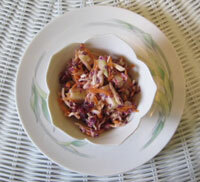 It is a colorful side dish for a tailgate party, potluck or holiday dinner. Combine carrots, parsnips, apples, cabbage, onion, parsley, cranberries and nuts. Add mayonnaise, yogurt, sugar, lemon juice and salt and pepper to taste. Note: If you do not digest raw onion well, add a tablespoon of water to the chopped onion in a small bowl and microwave it for about 30 seconds on high.